Gardening is a way of life, a passion which gives us a connection with the earth that sustains us. Since its earliest days, the art and science of gardening has been continually transformed and enhanced by great gardeners – men and women whose passion for gardening has driven them to improve and innovate, to overcome challenges and experiment with new ideas. These gardeners have provided inspiration for future generations, as have their gardens, which attract millions of visitors every year. From the greats of yesteryear to the best modern-day practitioners, the gardeners are drawn from throughout history and from around the world. The stories of their life and work are revealed, along with practical hints and tips that unlock the secrets gained from their long years of trial and error. Packed with botanical illustrations of their signature plants, the book also includes stunning photographs of twelve of the world’s most iconic gardens, from Jardin Majorelle in Morocco to Sissinghurst in Kent. 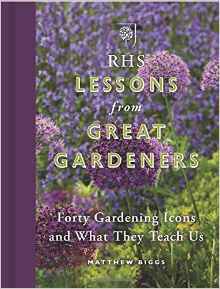 RHS Lessons from Great Gardeners is a journey through the world of gardening past and present, and a beautifully presented source of inspiration and ideas for all gardeners, great and small. This revised, re-illustrated, expanded edition of the classic ‘Complete Book of Vegetables’ contains all of the essential practical information to make your vegetable garden a success. It contains over 90 vegetables from familiar lettuce to exotic karela plus comprehensive lists of suppliers, RHS Award of Garden Merit and disease resistant varieties, ensuring that you only select the best for your plot. Each entry is accompanied by mouth watering recipes including several from Michelin starred chief Jean-Christophe Novelli. In Gardening at Eden, Matthew talks to the gardeners who have been experimenting at the ‘cutting edge’ since the beginning of the project, discovering how they transformed the site from a disused clay pit, with no life and no soil, fifteen metres below the water table, into one of the most exciting gardens in the world. So if you have ever wondered how to make your own soil, which bamboo’s are edible or how to plant bulbs on a sixty degree slope, this book describes their pioneering practices, so that everyone, every day, can garden the Eden way. Matthew and his fellow panellists John Cushnie, Bunny Guinness and Bob Flowerdew were asked to select some of their favourite garden plants and this is the result. Over 700 species and even more varieties from flowers to vegetables, annuals, perennials, shrubs and trees have been selected and described in detail and with passion. There is certainly something for you. If you’ve ever wanted detailed gardening advice from Matthew, Anne Swithinbank, John Cushnie and Bob Flowedew then here it is! From basic planning, propagation and hard landscaping to handy hints for making the most of your greenhouse, this book has it all. There are no complicated explanations, just straightforward, down to earth advice and ‘tricks of the trade’ gained from over 100 years worth of combined practical experience!